Bolton made the announcement to finish a two-day visit to Moscow. White House National Security Advisor John Bolton met with Russian President Vladimir Putin on Tuesday, finishing a two-day visit to Moscow by confirming that the U.S. will pull out of a landmark arms-control agreement with Russia, rejecting appeals from Russia and European countries not to do so. Sitting down with Bolton at the Kremlin, Putin proposed that he and President Donald Trump meet when the two leaders are in Paris next month for the 100th anniversary of the World War I armistice. Bolton accepted the proposal and later told media at a press conference that the White House would work to arrange the meeting. Bolton’s trip to Russia has been dominated by Trump’s decision to pull the U.S. out of the Intermediate-Range Nuclear Forces or INF treaty, an arms-control agreement credited with helping to end the Cold War. Signed in 1987 by President Ronald Reagan and Soviet leader Mikhail Gorbachev, the agreement bars Russia and the U.S. from developing and deploying ground-launched short- and medium-range missiles. Trump has said he is withdrawing because of Russian violations of the treaty and to free the U.S. to counter a nuclear buildup from China. The idea of withdrawal has prompted strong criticism from arms control advocates and some members of his own party who warn it would risk a renewed arms race. On Tuesday, Bolton made clear that the U.S. intends to go ahead with the withdrawal, calling the treaty “outdated” because it constrained the U.S. while other nuclear powers, in particular China, were freely amassing missiles banned under the treaty. "This was a Cold War bilateral missile-related treaty in a multipolar ballistic missile world,” Bolton said. For several years the U.S. has accused Russia of violating the treaty by developing a new cruise missile. Russia has denied this, and Bolton said the Kremlin's refusal to admit to the allegation meant the treaty was untenable. "How do you ask the Russians to come back into compliance with something they don't think they're violating?" said Bolton, noting the U.S. has been fruitlessly demanding the Russians comply since the Obama administration. He added that the U.S. would trigger the six-month withdrawal mechanism from the treaty "in due course." Russia opposes the U.S.'s exit, calling it dangerous. 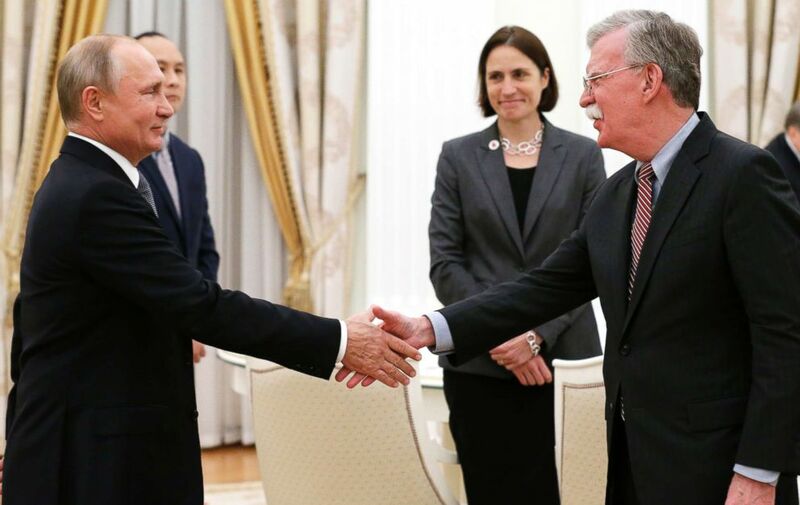 At their meeting, Putin chided Bolton. (Alexander Zemlianichenko/AP) Russian President Vladimir Putin, left, shakes hands with U.S. National security adviser John Bolton during their meeting in the Kremlin in Moscow, Oct. 23, 2018. Some European countries as well as senior Republicans politicians have called on the White House to reconsider the withdrawal. Some have also expressed hope the White House might try to broaden the INF treaty to include other nuclear powers, but Bolton suggested that was unlikely noting previous efforts had failed. Despite the controversy around the treaty, Bolton’s meeting with Russia appeared intended to mend some fences with the country following up on directives from Putin and Trump following their summit in Helsinki earlier this year. Bolton said the U.S. and Russia would resume dialogue on counter-narcotics and human trafficking, as well as high-level discussions on counter-terrorism. But Bolton courted new controversy in the U.S. with his assertion that Russia’s meddling in the 2016 election did not impact its outcome. President Trump has long insisted Russia's intervention had no effect, but Bolton’s statement goes beyond what the U.S. intelligence community has previously said and contradicts what some former senior U.S. officials have suggested. U.S. intelligence agencies have determined that Russia intervened in the 2016 election trying to tilt it in favor of Trump against his Democrat opponent, Hillary Clinton. They have not publicly assesses though whether the Russian effort altered the result. With the FBI saying that Russians are again targeting the U.S.’s November’s mid-term elections, Bolton said he hoped there would not be any meddling. Bolton said he had told the Russians that their previous effort had destroyed the U.S. and Russia's ability to work together, while producing nothing in return for Russia. “I think it’s a lesson: don’t mess with American elections,” he said.